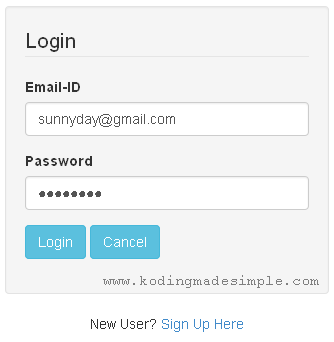 Today we'll see a codeigniter tutorial demonstrating user login and registration system. As you know Login and Signup Module (User Management System) forms the base for membership driven websites and applications. I have written about codeingiter login and registration process separately earlier, but got requests from blog readers to provide a complete user management module. So in today's post, I have tried to cover as much as possible in user module comprising home, login, signup and user profile/dashboard page. 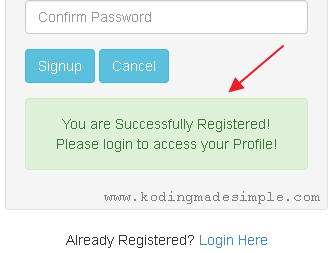 So let us see how to create complete codeigniter login and registration system. First create the mysql database required for the codeigniter user management system. Run the above the sql commands in mysql db and create the necessary database and table. To build our codeigniter login and registration system we need a bunch of controller, view and model files. Here are the files we are going to create. home.php - This is the Home page controller of the user management application. login.php - It's the user login form controller file. 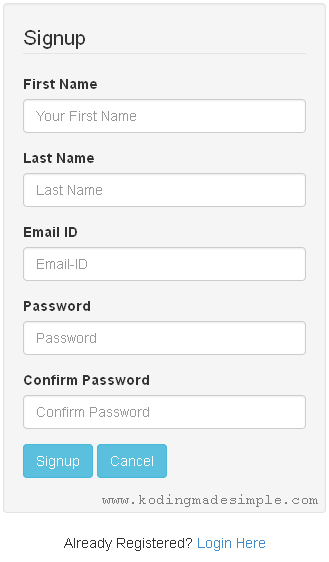 signup.php - This one is the user signup page(registration) controller. profile.php - This is the controller for my profile/dashboard page. home_view.php - It is the Home page view file. login_view.php - View file for login controller. signup_view.php - View file for signup/registration controller. profile_view.php – It is the user profile view file. user_model.php - This is the model file for the user management module. Here we place all the db transactions of the module. In case you don't know, below are the steps breakdown for what we are going to build in this user login/signup system in code igniter. The user enters the Home page which contains links for Login and Signup on top navigation menu. As for New Users » user click on Signup link » user redirected to signup/registration form » user fills up the form details and submit » process user details and store it into database » notify user. As for Registered Users » user click on the Login link on Home page » user redirected to login form » user enter login credentials » authenticate user and redirect to User Profile page. For Singed-in users » Show User's name and Logout link on top menu bar. When user clicks on Logout » destroy session and redirect to Home page. Note: As for designing user interface, I have used the readily available Twitter Bootstrap CSS as it's easier this way and mobile responsive in nature. Check here to know about using bootstrap with codeigniter framework. This is controller for the Home/Main page of the user management module and it shows Login and Signup link at the top menu for guests and User's Name and Logout link for signed-in users. This is the controller file for the codeigniter user registration form. It collects first name, last name, email id and password from the user and validates the input and stores it into database. 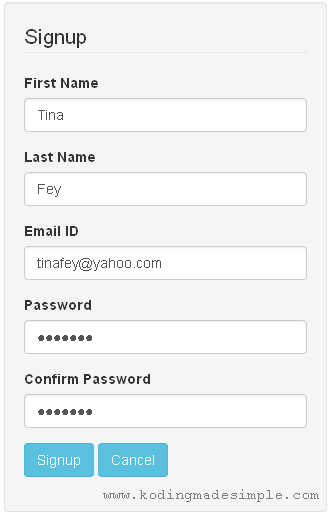 All fields are mandatory and once the user submits the form the input will be validated against a set of form validation rules. 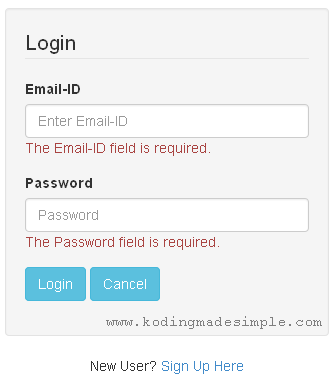 If the validation fails, user will be prompted to enter right data by showing the error message like this. If validation succeeds, registration process will be completed and notified to the user. This is the controller file for user login process. It asks for user's email address and password and check if the provided login credentials are correct or not. If user credentials are valid, then it will be stored in session and user will be redirected to profile/dashboard page. This is the controller for the User Profile page. It lists user profile summary and other details. That's it. These are all the important controller files required for the code igniter user registration and login system. Now run the app and go to Home page. Click on Signup link and it will take you to the user signup form. Now click on the Login link to go to the login page. Provide the email and password which you have registered earlier. Now you will be redirected to your Profile page. To sign-out the session, click on Logout link at the top navigation menu which will take you back to Home page. When I logged in, it shows "Wrong Email-ID or Password"
May I ask why the use of "ENGINE=MyISAM" and not "ENGINE=InnoDB"? I was under the impression that MyISAM is for version before mySQL 5.5. But it still not working. Can you tell me what should I do to fix this? yeah me too i think new ci cant work well this source ? how can i navigate the home page? 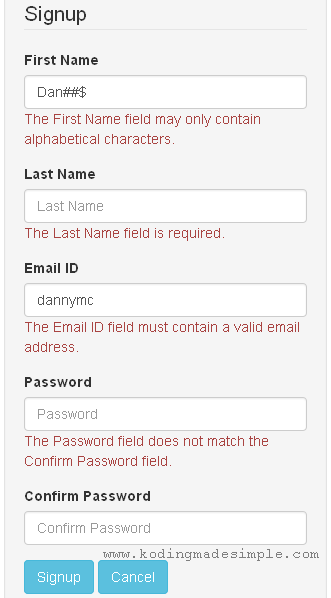 getting error during form validation as "The Password field does not match the Confirm Password field." Any help is much appreciated. Thanks. The below has solved my problem by update in singup.php in controllers. This sorted it for me. Many thank Pavan. doesnt work, can you help plz??? doesnt work, can you help plzz??? What's not working? Showing error? "The Password field does not match the Confirm Password field." Can you please be more precise? do you get error? on which part? How to make multi user login with this? Hi. Firstly thanks for the article - just what I was looking for as an introduction to CI and to help me develop a simple registration process. I have the home page wired up and working, but the login page is returning an error. I have the default group database set up and I'm using the mysqli db driver in my database config. Anyone seen this issue? I would be very grateful for some advice on this. I just noticed that you always load you helpers in php. Why not use the cofig? what the difference by then? Just for tutorial purpose and better understanding. In real time, you must take advantage of autoloading helpers and libraries at start. It is efficient & minimizes server load. That's what I thought. I almost read all the tutorials just like this one and I'm comparing each codes. I found yours more precise. I also want to include avatar on each users and also their level can you upgrade your snippet?Sorry for asking to much I'm just starting to code using codeigniter. Best regards. Hey this code works! Please make sure you have the login details in mysql db. Valli Pandy kindly can u tell me how can i create add user,group and permission on dashboard?? Valli Pandy, BTW your validation "xss_clean" I read at the stackoverflow is not necessary anymore. I think you must separate that kind of validation. Valli Pandy, BTW your validation "xss_clean" is no longer necessary I think you should separate that additional validation. Thanks for tutorial, but how do I create random numeric to Id instead of Auto_Increment? I move the code to a Github repo to help improve the system and provide better documentation going forward. Nice tutorial its working for me .